Bone spavin is a growth of irregular bony matter from the bones of the joint, and situated on the inside and in front of the joint. 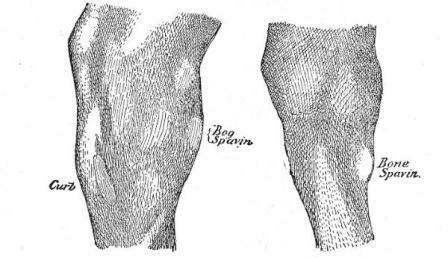 Cause.-The causes of spavins are quite numerous, but usually they are sprains, blows, hard work, and, in fact, any cause exciting inflammation of this part of the joint. Hereditary predisposition in horses is a frequent cause. Symptoms.-The symptoms vary in different cases. In some horses the lameness comes on very gradually, while in others it comes on more rapidly. It is usually five to eight weeks before any enlargement appears. There is marked lameness when the horse starts out, but he usually gets over it after driving a short distance, and, if allowed to stand for awhile, will start lame again. There is sometimes a reflected action, causing a little difference in the appearance over the hip joint, and if no enlargement has made its appearance, a person not having had experience is very liable to be deceived in regard to the true location of the difficulty. The horse will stand on either leg in resting in the stable, but when he is resting the lame leg he stands on the toe. If the joint becomes consolidated the horse will be stiff in the leg, but may not have much pain. Treatment.-That it may not be misunderstood in regard to what is meant by a cure, would say that to stop the lameness, and in most cases to remove the bunch on such cases as are not past any reasonable hopes of a cure. But I do not mean to be understood that in a case of anchylosis (stiff joint), I can again restore the joint to its original condition; for this is an impossibility, owing to the union of the two bones, making them as one. Neither do I mean that, in any ordinary case of bone spavin which has become completely ossified (that is, the bunch become solid bone), that, in such a case, the enlarge men t will be removed. In any bony growths, like spavin or ringbone, it will be exceedingly difficult to determine just when there is a sufficient deposit of phosphate of lime so that it is completely ossified, for the reason that in some cases the lime is deposited faster than in others, and therefore one case may be completely ossified in a few months, while in another it will be as many years. The cases which are not completely ossified are those that I claim to remove. One of this class which I have seen removed was a large bone spavin of four or five years standing, and I think that a large per cent of cases are not fully ossified for several months or years. I am well aware that many good horsemen say that it is impossible to cure spavins, and, in fact, this has been the experience of horsemen until the discovery of Kendall's Spavin Cure. It is now known that the treatment which we recommend here will cure nearly every case of bone spavin which is not past any reasonable hopes of a cure, if the directions are followed, and the horse is properly used.